If Kapri Bibbs runs a 4.36 this spring, it could be worth a million dollars. Kapri just finished a season for the record books. 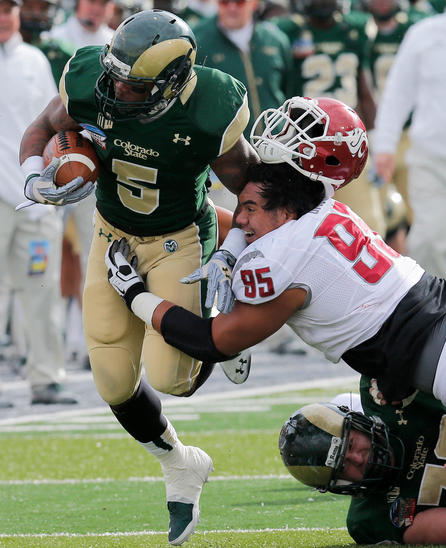 In his first season at Colorado State, Kapri Bibbs rushed for 1741 yards, averaging 6.2 yards per carry. He scored an incredible 31 touchdowns. Only two NCAA running backs have ever scored more, Barry Sanders and Montee Ball. In a two-game stretch vs. Nevada (11/9) and at New Mexico (11/16) Bibbs rushed for 603 yards and scored 10 touchdowns, easily the best two-game performance in CSU history. 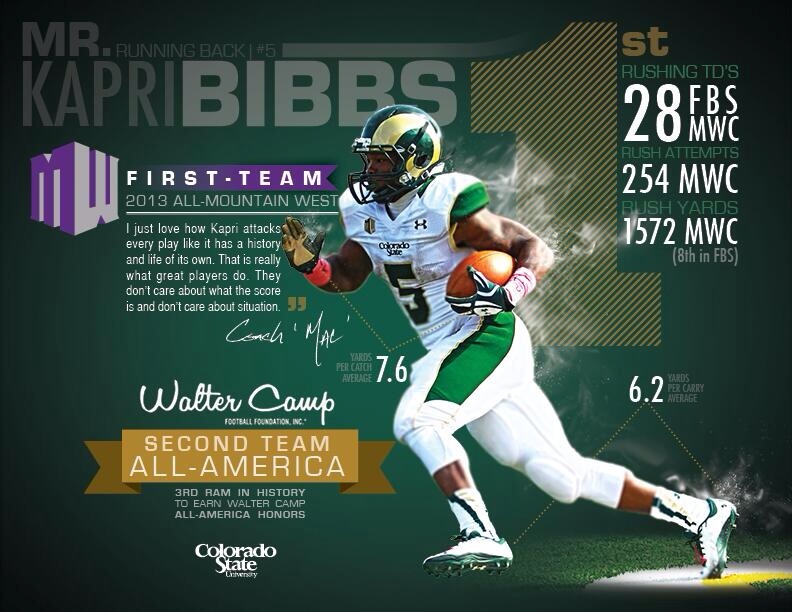 Kapri Bibbs was named 2nd team All America from the Walter Camp Foundation. Not only was Kapri Bibbs a rookie at Colorado State, but he didn’t start until the 8th game. Has there ever been an All-American who made his debut as a starter in game-8? “I just love how Kapri attacks every play like it has a history and life of its own. That is really what great players do. They don’t care about what the score is and don’t care about the situation” -Head Coach Jim McElwain after 11/16 win at New Mexico. Kapri is now attacking every workout like it has a history and life of his own. That’s what really great athletes do. 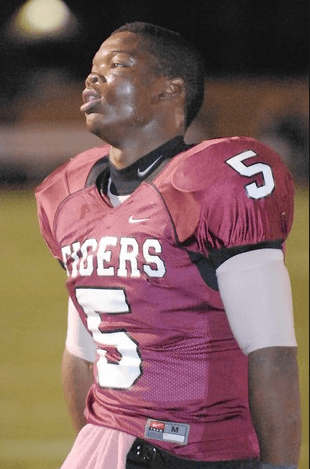 Kapri Bibbs was a good freshman football player at Plainfield North high school in 2007. He was the best running back on a freshmen team that went 8-1. In the winter, he participated in our speed & strength program. He had the look of a good athlete and decent speed. He was the 37th fastest guy in our program. His best time was 4.87, nowhere near the speed of our fastest guy, Jacob Arnold (4.39). Kapri’s average time was 4.98. To give you some perspective, this year we have 11 freshmen faster than Kapri was in 2007. 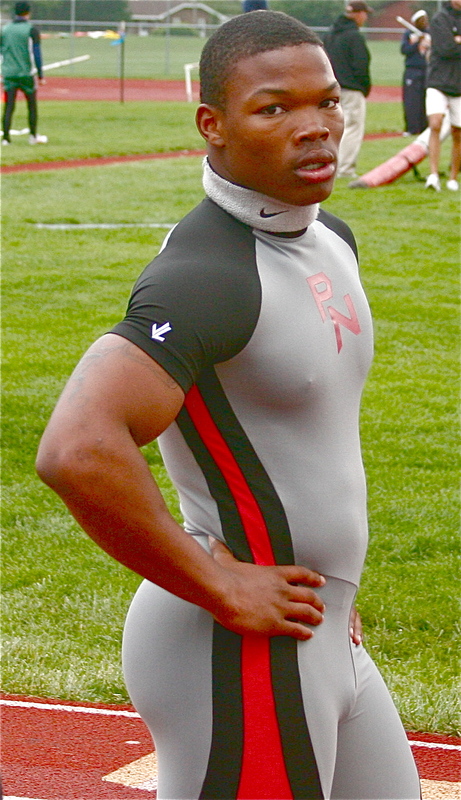 Kapri Bibbs ran track as a freshman. His 100 and 200 times were not good enough to win races (11.9 and 25.4). Despite his mediocre speed numbers as a freshman in high school, Kapri believes his freshman track season was a turning point for him. “My stride opened up and I started to feel fast”. David Epstein in his fantastic book, “The Sports Gene”, coined the term high responders. Kapri was a high responder to speed training. The next football season, Kapri Bibbs was again our best running back and one of the best players on our sophomore team. However, he was not the guy who got called up to the varsity. Cody Lopez, now playing for Central Michigan, got the call. You never know when an athlete will make a quantum leap. Kapri made a quantum leap during the winter of 2008-09. Kapri went from the 37th fastest guy at Plainfield North to being the 7th fastest. His average 40 time went from 4.98 as a freshman to 4.58 as a sophomore. On January 26, 2009, Kapri ran a 4.44. 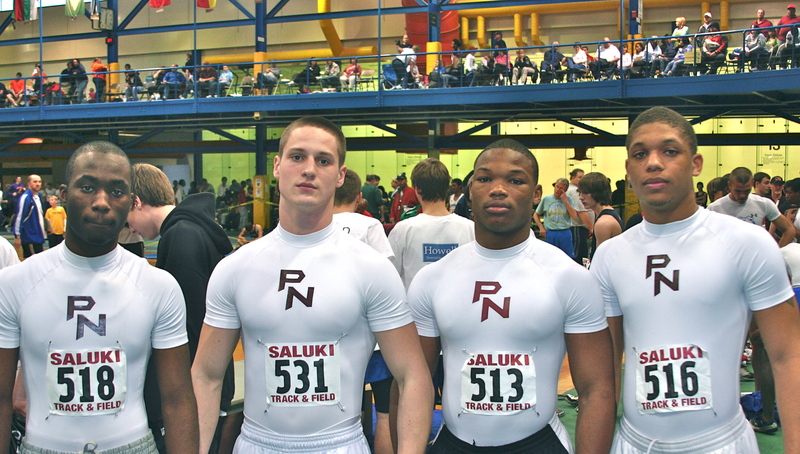 2010 at SIU indoor – 4×2 team finishes 3rd out of 41 schools. Marquis Flowers, Brent Shelton, Kapri Bibbs, and Devonta Davis. Click to enlarge. Speed in the 40 yard dash is true speed, so Kapri had a great sophomore track season. He broke our sophomore record in the 100 meters, running 11.0 (not bad for someone who ran 11.9 the previous year). He also improved his 200 time from 25.4 to 23.6. Kapri was the real deal and was headed towards a terrific junior football season. Kapri ran 10.8 as a junior. How can anyone think that track does not improve a football player? Click to enlarge. As a junior, Kapri played on a very good football team that made the playoffs and lost to St. Rita. He shared the limelight with Bryce Corrigan, a talented quarterback, and Devonta Davis, an amazing two-way player. Kapri was an excellent high school running back but not a star (yet). In his 3rd winter of speed training (2009-10), Kapri was an everyday guy and a hard worker. After being the 37th fastest as a freshman and the 7th fastest as a sophomore, Kapri was now the 2nd fastest. Six-time state medalist Marquis Flowers was the only guy faster. Kapri now averaged 4.44 in the 40, and had a best time of 4.37. Kapri was ready to break out. See Kapri’s winter speed data … PN WINTER TRAINING. As a junior, Kapri again ran track and improved his times. He ran 10.8 in the 100 and 22.8 in the 200. It didn’t take a rocket scientist to predict a big senior football season. All football players want to gain weight but the more you weigh, the slower you get (unless your explosive power increases proportionally). And … its easier to put on weight than it is to increase explosive power. 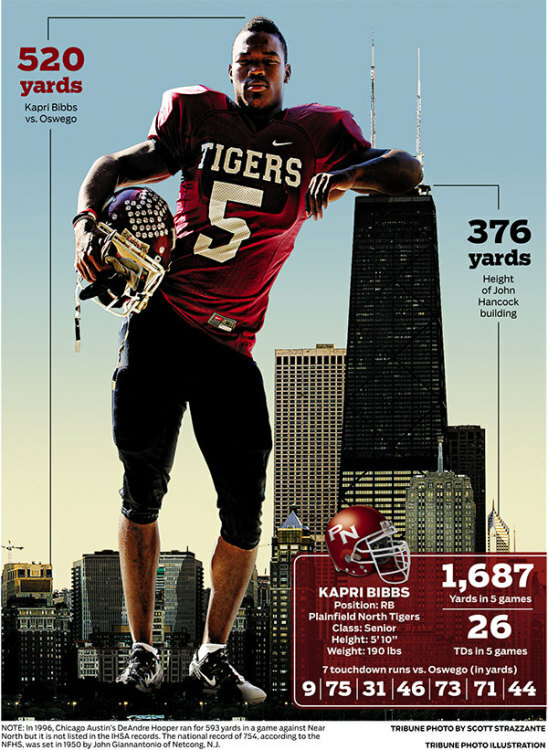 Kapri Bibbs had a legendary senior football season. He was a rock star. When we played conference powerhouse Oswego, Kapri had the game of his life. 520 yards rushing and 7 touchdowns … WOW. Kapri was being recruited by everyone. Bigger than life. Great picture from the Chicago Tribune. My favorite play of that 2010 season was against our rivals, Plainfield South. From his own end zone, Kapri Bibbs threw a perfect spiral nearly 60 yards to a wide open Evan Whaley completing a 92 yard touchdown play. It may have been the greatest pass I’ve ever seen. In addition to the touchdown pass, Kapri rushed for five touchdowns of his own and gained 395 yards on an incredible 56 carries to give Plainfield South their only loss of the season. WOW. How many guys can carry the ball 56 times for 395 yards and five touchdowns and still throw a 92 yard touchdown pass to beat an 8-0 team? Our 2010 football season ended with a loss in the 7A playoffs to a very good Glenbard West team. On the first play from scrimmage Kapri went 80 yards for a touchdown. Much to my disappointment, Kapri decided to join the bowling team for the winter of 2010-11. From what I heard, he bowled like a champ. He did stop in twice to get timed in the 40 that winter, running 4.36 and 4.35. Bibbs was, without a doubt, the fastest bowler in the country. The 2011 track season was not what I had envisioned for Kapri. I thought he looked heavy. Kapri now says he was a “fat” 195 pounds (compared to be a lean 206 pounds now). He also had a lingering soreness in his knee. At the end of the indoor season, we both decided to part ways. He needed to get his knee healthy and focus on his upcoming ACT. Kapri was the fastest guy at both summer football camps he attended in the summer of 2010, Northwestern & Bowling Green. When he competed in the “Fastest Man” competition in Joliet, he finished second to the legit-fast Dondre Adams of Plainfield South. Adams was hand timed at 4.27, Bibbs 4.29. Kapri’s ACT score kept him from attending Colorado State as a freshman. Instead, he attended Snow Junior College in Utah. Snow’s football team was ranked 3rd in the country in 2011. Kapri was the fastest guy on the team. As a sophomore, Kapri attended a community college in Fort Collins. He stayed active lifting and playing basketball but he played no football. I can’t imagine someone becoming an All American after sitting out 18 months. At Colorado State, Kapri was one of the three fastest guys on the team. When asked, who was fastest, Kapri replied, “We never raced but we need to”. With two years of eligibility remaining, Kapri Bibbs is headed to the NFL. The NFL combine will be here soon. Kapri is scheduled for a “Pro Day” at Colorado State on March 12th. Didn’t start till the 8th game. These stats did not include the bowl game. Click to enlarge. In his present training, all lifting is done in 10 second intervals and Kapri is instructed to hold his breath during the lift. Since sprinting is 100% anaerobic, his trainer is trying match the physiology of strength training to the sprint training. Kapri will never run a lap or do repeat 200’s. It’s all about max speed … finding the 5th gear. Kapri says his training is “just like speed training at Plainfield North”. Even though Kapri Bibbs is not presently ranked in the top 10 running backs entering the NFL draft, that could change in about one-tenth of a second. 4.36 in the 40 will make Kapri a 2nd-round pick. 4.36 will turn Kapri Bibbs into a millionaire. 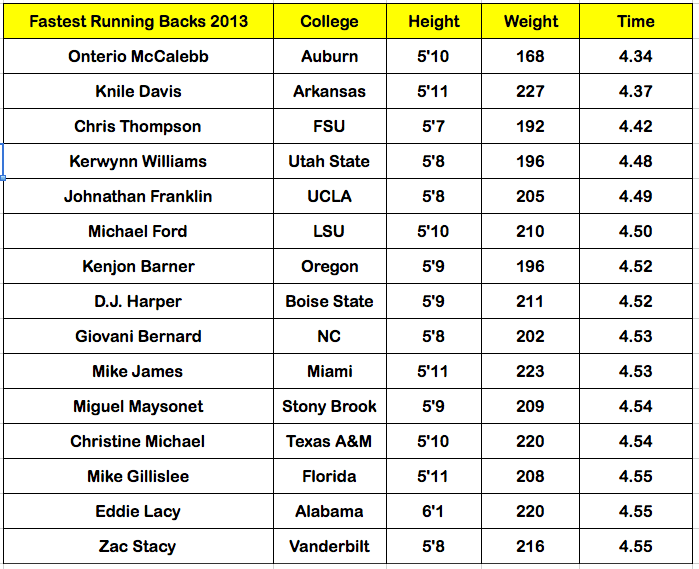 These are the best RB times from the 2013 combine. It’s important to note that these 40’s were done on one day … some guys may be faster than their time shows. Eddie Lacy was Rookie of the Year. Zac Stacy had a great year for the Rams. Giovani Bernard was very good for the Bengals. Click to enlarge. Remember, Kapri’s goal of 4.36 is on turf not a track. In addition, the timer sits and stares at the runner, starting the watch at his movement. The runner is in a 3-point stance. A photo gate electronically terminates the watch at the 40 yard mark. The NFL combine is not hand held and is not FAT … it’s a hybrid of the two. Those of you who have read my previous blogs know that our timed 40’s are very fast. I allow an upright, leaning start. We run on a hard surface and allow spikes. Our 40’s are hand-held, not FAT (Fully Automatic Timed). Kapri has high hopes of running 4.29 hand held on a track with his trainer which should be fast enough to run 4.36 at his Pro Day and/or at the NFL combine. When asked about the importance of the shuttle, standing long jump, vertical jump, etc … Kapri says “It’s all about the 40”. See article … IMPORTANCE OF 40 TIMES. From Dallas Cowboys … “The results (of our study) are obvious: speed kills for running backs. Of the running backs I charted, those who ran a sub-4.40 at the combine have produced at over six times the rate of those backs who ran 4.50 or worse.” See entire article … WANT AN NFL RUNNING BACK? LOOK FOR SPEED. It will be fun to see De’Anthony Thomas (running back) run the 40 at the combine. The Oregon track/football star was pretty fast in high school … 100 meters in 10.57, 200 meters in 20.61.
Who will be the first wide receiver in the draft? Sammy Watkins from Clemson will be the first receiver taken because he is FREAKY FAST and he has proven speed data. In high school, Watkins ran the 60 in 6.91, the 100 in 10.45, and the 200 in 21.11. Sometimes a picture speaks volumes. Kapri’s younger brother Marcus Edwards made his varsity debut as a sophomore this year. On October 4th, Marcus carried the ball 48 times for 409 yards to lead Plainfield North to a 31-19 win over Romeoville. Marcus is also ahead of Kapri’s speed numbers. His average 40 time this winter is 4.47 with a winter best of 4.38. Last year, Marcus could not run track due to grade problems. We hope he runs this year. Kapri’s sophomore brother, Marcus Edwards, shown here helping me out during a freshmen football game. With all this talk about speed, it is surprising to note that we have a couple of kids from our 9-0 freshmen team who are electing to be one-sport athletes. It’s sad to see kids get bad advice. I blame personal trainers for most of these problems. Personal trainers must recruit kids away from sports in order to make a profit. Money is the root of all evil. Parents … stop trying to “engineer” your kid’s athletic success. Stop signing your kids up for individualized instruction that takes them from their teammates and their coaches. Trust your high school coaches and let your kids play multiple sports. 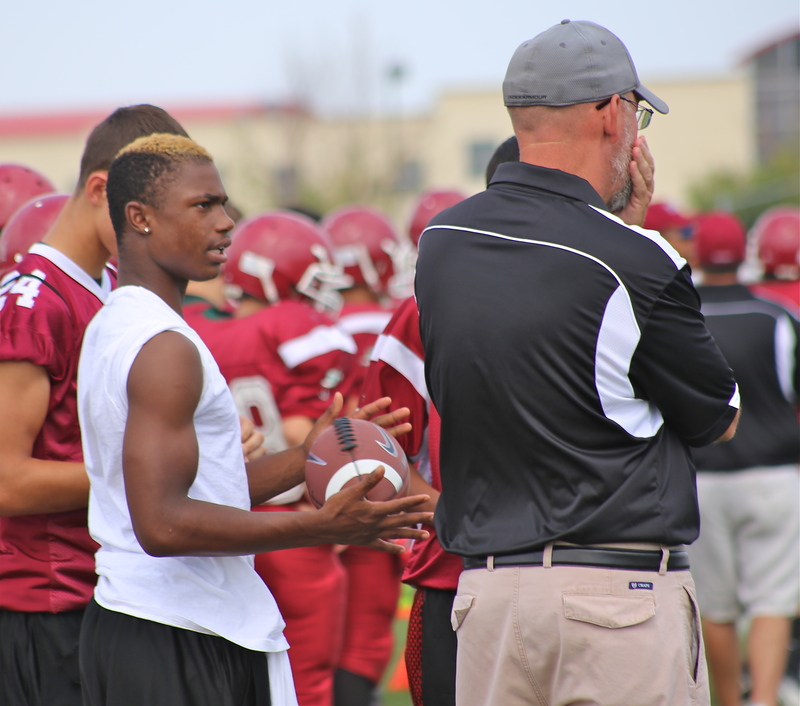 Kapri Bibbs was “trained” by the coaches of PNHS. I am proud to say, with the exception of boy’s basketball, our best male athletes typically play more than one sport. The 12-month modus operandi of modern boys basketball is unfortunate (I’m trying to be nice). Girls volleyball is worse. I’m very lucky to work with a progressive football staff. Head Coach Tim Kane has been a track coach in the past. He studies the speed and explosive training methods used by Oregon to “make bullets instead of bowling balls”. Offensive Coordinator John Darlington is a very successful head baseball coach but he encourages all non-baseball players to run track. Why would anyone choose slow over fast? One-sport athletes are making a huge mistake. Did LeBron play one sport? Did Peyton Manning play one sport? Bo Jackson? Deon Sanders? Michael Jordan? 90% of all great athletes played multiple sports. Where would Kapri be without track? To deny the value of track & field for football players is comparable to denying climate change, evolution, gravity, inertia, conservation of mass, etc. Kapri Bibbs placed 3rd overall among running backs in the bench press. He did 24 reps of 225. He did poorly in both jumps, vertical 29″ & standing long jump 8’10”. In the standing long jump, he re-aggravated his turf toe that has bothered him for over two months. Ever sprint with a sprained toe? Kapri ran 4.67 official. He told me that in hindsight, he should have only done the 40 … nothing more. Nothing else matters. 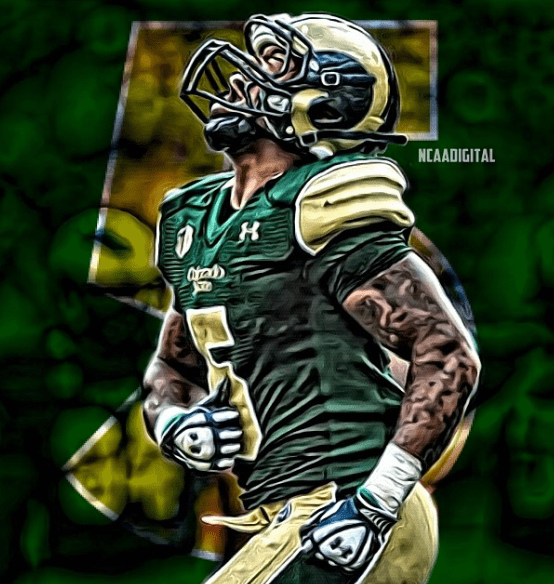 Kapri is looking forward to his Pro Day at CSU March 12. I hope he slims down some … I talk about this in a future blog … Vertical Force. It is my hope that NFL teams will put emphasis on Kapri’s speed in his highlight video. I look forward to the explanation for that disastrously awful Combine performance today. Not just the run, but the vertical and the broad jump. Because if that was a failure of training, of preparation, we need to know how and why. For an explanation, see my addendum.